There are 30 reviews of Vent Vert (new). I never smelled this before so, I don't know how much it has changed. I have the bottle with the "golf ball" cap. I enjoy this. I'm not a huge fan of greenish-florals, either. At first I get basil, lime, green notes, some fruit - all settling down together. Copious amounts of freesia kick in. A flower I am not always keen on. Here, it's friendly. Then notes of hyacinth and jasmine take over. Lily of the valley and rose then add to the bouquet. Finally, a gentle base of amber, oakmoss, musk, and sandalwood. Lively fragrance with some summery refreshment. Referring to the current version with a lid like a tacky silver golf-ball, not the sublime original. Have had more pleasant things squirted at me from dispensers in public toilets. Would rather stick needles in my eyes than wear this again. Will use up mini of beautiful original and accept that it's dead. The aldehyde laden galbanum and cut grass opening is fiercely refreshing, though it soon softens under the influence of white floral notes. The central accord, established within just a few minutes, is soapy white flowers, grass, and powder. The effect is spotlessly clean and prim, but truth be told, it also smells frigid. Where even the notoriously unyielding Chanel No. 19 warms its heart with a generous dose of iris, Vent Vert in its current incarnation is outright antiseptic. Vent Vert is both linear and ephemeral, leaving me with the impression that I’ve washed my hands with green floral scented soap. 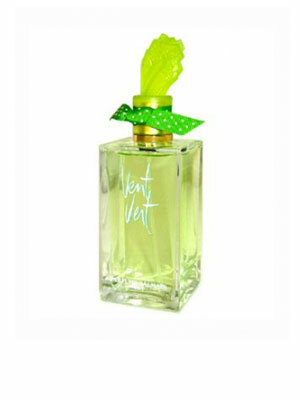 Whatever Vent Vert was in 1947, it no longer stands among the best green fragrances. For that I’d turn to the aforementioned Chanel, Bel Respiro, Eau de Campagne, Jacomo’s Silences, or the recently defunct Virgilio. I can understand why the classic green floral seems dated to some. The grassy green floral is the product of an era. Each decade, the 50s, the 60s, the 70s had its own take on the genre, yet they are remarkably of a piece. I won’t attempt to distinguish between the green florals and many of the green chypres, as the similarities are greater than the differences. Also I’ve driven myself to distraction trying to separate the chypre from the floral among the reformulations of perfumes such as Estée Lauder Private Collection (1973), Jacomo Silences (1978) and Ma Griffe (1947). Green Florals connote a conciseness, a togetherness, a sense of preparedness and self-assurance that suited the femininity of each of those decades. In the 1940s/early 1950s, a complicated era for American women whose social and private roles changed drastically from the World War II period to the Cold War period, the briskness and confidence of the green floral spoke to an inner steeliness that some women might have felt obliged to disguise. 1947 was a pivotal year, arguably giving birth to the genre that would come to define the next few decades: Cellier’s Vent Vert, Miss Dior and Ma Griffe (two green floral chypres) Green Water by Jaques Fath and Balenciaga’s green-pitched violet aldehydic floral, le Dix. The 1950s produced some seminal green floral perfumes: Jolie Madame (1953) Diorissimo (1956). In the 1960s, the green floral spans the primness of the Guerlain patron in her Chamade (1969) to the stylish Robert Piguet Futur (1960) customer to the nascent free spirit in Guy Laroche Fidji (1966). The 1970s was both the pinnacle and the denouement of the green floral. It ranged from inexpensive but quality drugstore perfumes such as Revlon Charlie (1973), Coty Smitty (1976) and Prince Matchabelli Cachet (1973) to the more soigné department store perfumes such as Estée Lauder Private Collection & Aliage (1972), Weil de Weil (1971), Chanel 19 (1971), Paco Rabanne Metal (1979). The green floral, formerly seen and appreciated for its steel and it's stature, came to seem quaint next to the monster Orientals and steroid florals of the early 1980s. Vent Vert (1947) put a chill on the green floral. Whatever the original by Germaine Cellier might have been, the 1991 edition I have by Calice Becker is rich and glass-like, full but also hard to the touch. It seems equally floral and grassy, with all elements circling the sharpness of galbanum, the principle element of the fragrance. There is a wonderful convergence of notes—pepperiness, sappiness, cut grass, muguet and crushed leaves—that support a crisp rose that is the only hint warmth to be found in the perfume. Having read much about the original version by Cellier but never having smelled it, I would say that Becker’s version matches the descriptions of the original, but due to restrictions of ingredients and without access to the bases Cellier is known to have used, can’t be identical. Becker’s apparent streamlining of the composition shows judicious editing and some bold choices, and her Vent Vert is invigorating and distinctive. (Actually a review of the 1999 formulation): On the hunt for a great green fragrance, this one was recommended as a classic of the genre. But I didn't like it! Too floral for me, and something here feels dated. With a better nose I could describe exactly why/where this "old fashioned" feeling is coming from. It might be the heavy powder scent that seems to hang over it like a muff. C'est la vie. Vent Vert BALMAIN Eau de Toilette EDT Women Spray 3.3 fl.oz.